Hun Yuan Taiji system was created by the late Grandmaster Feng Zhiqiang, a disciple of Chen Fake, that blends traditional Chen-style Taiji with Xinyi Quan. Time: 9:00 a.m. - 12:00 p.m. & 2:00 p.m. - 5:00 p.m.
Pre-registration: RSVP on line or email Yan Li at yli.taiji@gmail.com. Make Check payable to: Anthony Wong & send check to American Chen Taiji Society, P.O.Box 156, Moffett Field, CA 94035. The "Eight Energies", also called the "Eight Methods", are the elemental building blocks of Taijiquan movements. These are: peng (to expand/ward off), lu (to divert/roll back), ji (to press), an (to push), cai (to pluck), lie (to split), zhou (to strike with the elbow), and kao (to lean/strike with the torso). The Eight Energies embody the essential dualities of Taijiquan: opening/closing and softness/hardness. The eight energy drills can be practiced on their own both for the general health benefits of Taijiquan and as a training tool for Taijiquan as a martial art. This 3-part workshop series is suitable for both Taijiquan beginners (no prior experience) and for experienced students interested in improving the quality of their movements in handforms and push hands. At the workshop, participants will 1) learn and grasp the Eight Energy drills discrete exercises and in a sequential flow, 2) explore and practice where and how each energy is expressed in the form sequences using select postures in Chen Family Taijiquan Laojia Yilu and Erlu, and 3) explore and practice how to apply the eight energies in pushhands through simple (and fun!) partner exercises. Time: 2:00 p.m. - 2:30 p.m. Location: corner Walgreen parking lot at 22nd Avenue and Irving Street, San Francisco, CA 94122. Location: San Francisco Peninsula, TBA after pre-registration. Cost: $50 if pre-registered by September 2. After September 2, additional $10 per person, cash only. Special rate for Certified ACTS Instructors and current Saturday classes students. Pre-registration: RSVP and registration with Irene Hu at irene.hu@gmail.com required. Location details available upon registration completion. Master Tony Wong has learned Xingyi Quan and YiQuan from Grandmaster Chen ZhengZhong (陳正中), disciple of Grandmaster Ning DaChun (寧大椿) who had taught Fu JianQiu's (傅剑秋 - 河北形意拳) Hebei Xingyi Quan and Wang XiangZhai's (王薌齋) YiQuan. Prerequisite: Session 1 - open to all levels. Sessions 2 to 4 - open to participants who have completed the entire Laojia Yilu sequence. Session 1: Practice 8 energies drills for the first 2 hours with particular focus on body alignment, coordination, weight shifting with stepping to build root strength, connecting and balance. The last hour will be spent practicing Wuji stand and correct body alignment to achieve natural equilibrium stage, then work on standing posture with intention leading to whole body integration. Cost: $50 if paid by pre-registration date, additional $10 after; cash only at the door. Sessions 2, 3 and 4: We will divide the Lao Jia Yilu into 3 sections. First hour of each workshop session will go over the details of each section of the Lao Jia Yilu form then analyze applications of that section with practice in pairs for the remaining 2 hours. We will drill in depth on a few selected applications and go over the relationships of those applications in spar and push hands situations and learn how to make it work. Cost per workshop: $50 if paid by workshop pre-registration date, additional $10 after; cash only at the door. Payment can be made at $50 per workshop, or $150 by Feb 18 to attend all four sessions. Email Kathleen at zkmc@yahoo.com for RSVP and workshop details. Cash preferable or Make checks payable to: Kathleen McCarty. Location information will be sent upon payment received. Pre-registration: RSVP on line or email irene.hu@gmail.com by November 3. Make Check payable to: Anthony Wong & send check to American Chen Taiji Society, P.O.Box 156, Moffett Field, CA 94035. Fund-raising event for Grandmaster Chen Qingzhou Memorial Park construction. Additional donations accepted. Location: South Bay, TBA after pre-registration. Cost: $220 both days or $120 one day, if payment received by June 17. After June 17, additional $20 per person, cash only. Pre-registration: Limited to 30 participants. RSVP on line and follow payment instructions. Yi Jin Jing (Tendon-Muscle Strengthing Qigong) - focuses on turning and flexing the spine to improves flexibility, balance and muscular strength. This twelve-section routine is a contemporary compilation and features soft, extended, even movements that invigorate the limbs and internal organs. Liu Zi Jue (Six Healing Sounds) - a qigong routine that regulates the rise and fall of Qi (vital energy) through the inhalation and exhalation of six sounds. The routine aims to strengthen the liver, heart, spleen, lungs and kidneys, thus helping to balance the energy and functions of the internal organs, exert a calming effect and alleviate stress. Professor Limin Qu: Associate Professor of Chinese Medicine at Beijing University of Chinese Medicine, Courtesy Professor at Zhejiang University and Shanghai Jiao Tong University, Special Consultant at Tsinghua University and President of Beijing Tian Ren Yi Yi Chinese Medicine Research Institute. Several of Professor Qu�s books and lecture series on Chinese medicine and health traditions have been featured on national television, including the widely popular �Four Traditional Qigong Methods�, the �Huangdi Neijing Wisdom� series, �Healthy Living in Four Seasons�, �Ten Days on Healthy Living� and �Talking about Health from Head to Toe�. Cost: $60 if pre-registed by May 14. After May 14, additional $10 per person, cash only. Pre-registration: Limited to 30 participants. RSVP on line. 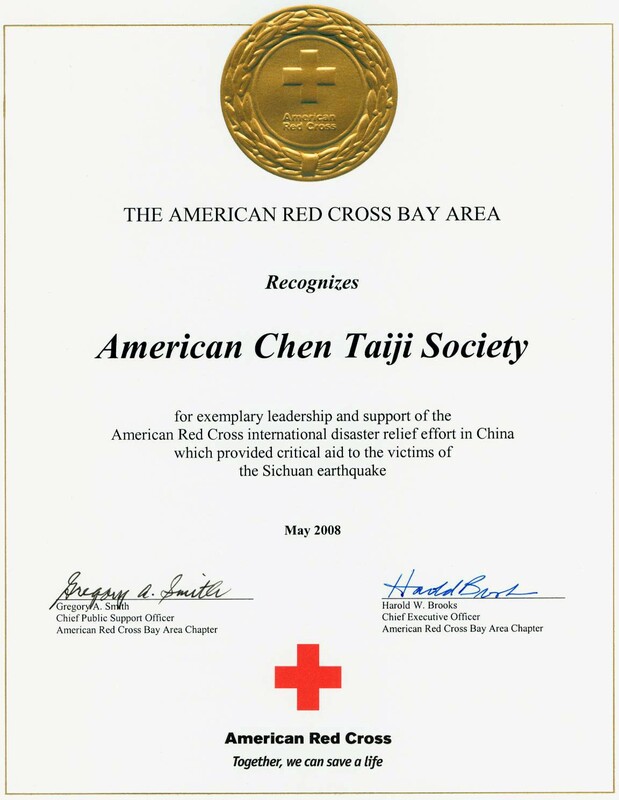 Make Check payable to: George Lau & send check to American Chen Taiji Society, P.O. Box 156, Moffett Field, CA 94035. Master Chen Bing: a 20th Generation direct descendant of Chen Family Taijiquan and nephew of Chen Xiaowang; three-time National Push-Hand Champion from China; a three-time first place winner in Push-Hand and Taijiquan in Wenxian, China; a two-time International Taiji Competition Gold Medalist; head of Taiji coach at the University of Shanghai for many years before he returned to Chenjiagou. Chen Taiji Pushhands patterns in the morning and Pushhands applications in the afternoon. Cost: Pre-registration by March 12 - $120 for one day or $70 for half day. After March 12, additional $20 per person. Bring CASH to workshop if check not received by March 12. Cost: Pre-registration by March 19 - $220 for both days or $120 for one day. After March 19, additional $20 per person. Bring CASH to workshop if check not received by March 19. Registration: Limited to 30 participants. RSVP and registration with Irene Hu at irene.hu@gmail.com required. Location details available upon registration completion. Make Check payable to: George Lau & send check to American Chen Taiji Society, P.O. Box 156, Moffett Field, CA 94035. Get-together dinner with Master Chen Youze, for participants from both workshops, is scheduled on March 27, at 5:30pm. Restaurant - TBD; Estimated cost: $25; RSVP to Irene at irene.hu@gmail.com for the dinner and location by morning of workshop. Master Chen Youze: a 20th Generation direct descendant of Chen Family Taijiquan and the eldest son of Grandmaster Chen Qingzhou. He is a three-time national confrontational push-hand champion, a China National coach, and is Competition Judge for China national wushu forms, weapons and Chen Style push hands. He was also appointed as the Head Instructor for Guan Dao team in Chen Village for the first Annual International Taijiquan Conference. He is widely acknowledged for his distinctive Fa Jin power. Click Zun Gu Taijiquan demo and Guandao and Push Hands demo for coverage on Master Chen Youze from a recent visit. Time: 11:50 a.m. - 12:30 p.m. Location: Millbrae Library parking lot: 1 Library Ave., Millbrae, CA 94030. Location: Mountain View Recreation Center, Ground Floor, Auditorium, 201 Rengstorf Ave. (cross St. Central Expressway). Please come join the group practice Chen Taiji (any style) with your school and friends. Dress in Taiji uniform, if you have it. Bring your school, group and friends to join and promote Taiji together. It will be broadcasted on October 18th across the world. Grandmaster Chen Xiaowang, Standard Bearer of Chen Taiji, will be teaching the complete Xin Jia ErLu Pao Chui (New Frame Second form). Time: 9:30 a.m. - 12 noon & 3:00 p.m. - 5:30 p.m., both days. Celebration dinner for Grandmaster CXW's 70 years old birthday will be held on 10/11 Sunday after workshop. $25/person. RSVP to Irene Hu at irene.hu@gmail.com for dinner and workshop details. Location: Palo Alto/Los Altos area. Cost: Pre-registration by Oct. 2 - $240 for both days or $140 for one day. After Oct. 2, additional $20 per person, cash only at the door. Cost: $50 for 1 session, $80 for 2 sessions, $110 for 3 sessions or $140 for all 4 sessions. Chen Taiji Performance Program: Chen Taiji Lao Jia Yilu Form (old frame first routine) by Valerie Wong. Chen Taiji Hunyuan Dao (saber) Group Set by Irene Hu, Penny Nii, Angela Ng, Kyle Chan, Marlene Semense, Valerie Wong and Derek Truong. Chen Taiji Xinjia (new frame) Jian (sword) by Doug Henry. Chen Taiji Laojia Dao (saber) by Derek Troung. Chen Taiji pushhands by Ryu Cheng and Sam Chan. Performance at Cupertino Memorial Park (corner of Stevens Creek Blvd. and Mary Ave) at 12:30 p.m. to 1:00 p.m.
Master Chen Youze will be teaching two public workshops in the SF Bay Area. Pear Blossom Spear, also called "Pear Blossom Spear with White Ape Staff", is a long-weapon set in Chen Style Taiji. It combines the advantages of both the spear (e.g., linear thrusts) and the staff (e.g., wide-range sweeps) with the essential Chen Taiji principles of spiraling and stickiness, resulting in a unique and versatile set of applications. Participants are expected to bring their own spear. Pole-Shaking is a unique training method in Chen Taiji for cultivating internal explosive power and endurance. Participants who do not have a taiji pole may use their spear for this part of the workshop. Time: 9am - 12pm & 2pm - 5pm; Location: TBA after pre-registration. Cost: Pre-registration by March 16 - $220 for both days or $120 for one day. After March 16, additional $20 per person. Bring CASH to workshop if check not received by March 16. Registration: Limited to 30 participants. RSVP and registration with Sifu Tony required. Make Check payable to: Anthony Wong & send check to American Chen Taiji Society, P.O. Box 156, Moffett Field, CA 94035. With Master Chen Youze: Friday, March 20, 3-5pm, McKenzie Park, Los Altos. Cost: $30 with pre-registration for March 21/22 workshop; $40 without pre-registration. Chen Style 26-Posture Form was developed from traditional Chen forms as an introductory form and is a great tool for reviewing and refining some of the most fundamental elements of old style Chen Taiji. The form is composed of 26 postures (as its name suggests) and takes about 3-5 minutes to perform. This two-day workshop will teach the 26-Posture Form from the beginning to the end. Participants will also learn and practice the 8 energy drills with "fajin" as supplementary training. Cost: Pre-registration by March 30 - $220 for both days or $120 for one day. After March 30, additional $20 per person. Bring CASH to workshop if check not received by March 30. Workshop is full. Registration has been officially closed as of 3/28 due to overwhelming response. *** A thank-you & farewell dinner with Master Chen Youze, for participants from both March and April workshops, is scheduled on April 5, at 5:30pm. Restaurant - TBD; Estimated cost: $20-30; RSVP to Irene at irene.hu@gmail.com for the dinner and location by morning of workshop. Location: Laurelwood Park at 3471 Glendora Drive, San Mateo, CA 94403. This review is set up for current Xin Jia students to catch up from beginning of the form to first "Cover the Hand Punch" or third "Jin Gang Pounds with the Pestle" movement. Free for students currently registered for the monthly Sunday Xin Jia class. Master Wong will be presenting Wuji Qigong to align 3 major acupressure points to achieve optimal body posture and maximize internal energy flow. He will also be presenting Hunyuan Qigong to help students use external movements to guide the internal energy. Cost: Pre-registration by May 11: $30 per person. After May 11: $40 per person, cash only at the door. Registration: Limited to 30 participants. Cost: Pre-registration by May 11: $60 per person. After May 11: $70 per person, cash only at the door. Make check payable to: Anthony Wong & send check to American Chen Taiji Society, P.O. Box 156, Moffett Field, CA 94035. Xin Jia review class with Sifu Tony on May 11, 10 a.m. to 12 noon at Daly City Westlake Park Community Center, 101 Lake Merced Blvd., Daly City, CA 94015. Cost is $20 for workshop attendees not in Tony's regular Sunday Xin Jia review class, $30 for public and FREE for students already attending Tony's regular Sunday Xin Jia review class. Chen Taiji Performance Program - Chen Taiji Lao Jia Form (Mountain View group), Lao Jia Dao (Anthony Cheung), Chen Style Hun Yuan 48 Form (YMCA group), Taiji Spear (Jeff Weitzel), Taiji Bang (Vivian and Irene). Cupertino Memorial Park (corner of Stevens Creek Blvd. and Mary Ave) at 12:30 p.m. to 1:00 p.m.
2/28 - 3/1 Arnold Sport Festival: Award Recipient from Honorable Arnold Schwarzenegger. Chen Tai Chi Performance is main martial art attraction on main stage. Push Hands Workshop on both days, 7-9 p.m. Combine internal and external energy to increase your health, balance and power. Align your breath, movement, and awareness in these exercises for healing and meditation. Learn how the Chinese categorize our movement and power into 8 distinct energies. Time: 9 a.m. - 12 p.m., 2 p.m. - 5 p.m. daily. Location: Mid-Peninsula area. RSVP Sifu Tony for details. Cost: Pre-registration by March 15 - $220 for both days or $120 for one day. After March 15, additional $20 per person. Bring CASH to workshop if check not received by March 15. Workshop Instruction: Master Chen Youze will be teaching Chen Style Lao Jia Taiji and applications in the morning, 8 energies drill and 5 patterns of Chen Taiji Push hand drills in the afternoon. Get together dinner after the workshop: March 23, 5:30 pm. Restaurant - TBD; Cost: $20; RSVP to Irene at irene.hu@gmail.com for the dinner and location by morning of workshop. Master Chen Youze: a 20th Generation direct descendant of Chen Family Taijiquan and the eldest son of Grandmaster Chen Qingzhou. He is a three-time national confrontational push-hand champion, a China National coach, and is competition judge for China national wushu forms, weapons and Chen Style push hands. He is widely acknowledged for his distinctive Fa Jin power. Click Zun Gu Taijiquan demo and Guandao and Push Hands demo for coverage on Master Chen Youze from a recent visit. Time: 1:30 p.m. - 2:00 p.m.
Tuesday - 8/20/2013 from 6:30 - 8:15 p.m.: No lesson. Self Study to develop the four Push Hand energies. Location: Mountain View. Contact Irene at irene.hu@gmail.com for details. Cost: $60 (pay at first session) for all four sessions or $20 for individual session. Time: 9 a.m. - 12 p.m. & 2 p.m. - 5 p.m. each day. Location: In the mid peninsula area. RSVP to Sifu Tony at wongwaiyi@hotmail.com and he will send you the detail information. Cost: Pre-registration by June 29: $220 for both days or $120 for one day. After June 29: additional $20 per person; bring CASH to workshop if check not received in mail by July 6. Registration: Limited to 30 participants: RSVP and registration are required to Sifu Tony. Make check payable to: Anthony Wong & send check to American Chen Taiji Society, P.O. Box 156, Moffett Field, CA 94035. Master Zhu Tiancai: a 19th Generation of Chen Family Taijiquan; one of the "Four Warriors" from the Chen Village. He started learning from Grandmaster Chen Zhaopi and Grandmaster Chen Zhaokui from a very young age. His performance of Chen Taijiquan forms is described as "smooth flowing" and "soft," reaching his audience with beauty and relaxation. With over fifty years of teaching experience, Grandmaster Zhu has compiled a set of teaching methodologies useful for both beginners and professionals. Click here for a Kung Fu Magazine article on Master Zhu Tiancai. Time: 9:00 a.m. - 12:00 p.m. (Xin Jia Yilu) & 2:00 p.m. - 5:00 p.m. (Push Hands) each day. Location: In the mid-peninsular area. RSVP to Sifu Tony at wongwaiyi@hotmail.com and he will send you the detail information after registration. Cost: Pre-registration by June 8: $200 for both days or $120 per day or $70 per individual section. After June 8: additional $20 per person. Cash only at the door. Registration: Limited to 30 participants. RSVP and registration are required to Sifu Tony. Make check payable to: Anthony Wong & send check to American Chen Taiji Society, P.O. Box 156, Moffett Field, CA 94035. Get together dinner after the workshop: June 23, 6pm. Restaurant - TBD; Cost:$20; RSVP to Irene at Irene.hu@gmail.com for the dinner and the location on the morning of workshop. Xin Jia review class with Sifu Tony on June 9, 10 a.m. to 12 p.m. ($20 for pre-registered workshop attendees, $30 for public) at Los Altos McKenzie Park, 707 Fremont Avenue, Los Altos. Special guest appearance with Master Chen 7:30 pm - 8:30 pm on June 20 at Daly City Westlake Park Community Center, Room 14, 101 Lake Merced Blvd., Daly City. Master Chen will explain the fundamentals of Taiji Quan and illustrate how to apply the principles of stance and Silk Reeling to Taiji practice. He will also perform the Xin Jia YiLu form. Demonstration of Xin Jia Chen Taijiquan and Q/A Session at 7:00 p.m. - 8:00 p.m. in Daly City Westlake Park Community Center, Room 14, 101 Lake Merced Blvd., Daly City, CA. $10 contribution for guest appearance. Master Tian Qiuxin: 19th Generation of Chen Family Taijiquan from Beijing; nephew of Master Tian Xiuchen, a famous disciple of Grandmaster Chen Fake. Sunday - 9/2/2012 from 9:00 a.m. to 12:30 p.m. The Xin Jia Yilu that will be taught in this workshop is the direct version from Master Chen Xiaowang without any derivations. Sifu Tony wants to emphasize the Xin Jia Yilu in this workshop so we have more people ready for Master Chen Xiaowang's Xin Jia Pao Chui next year. Fee: $150 for all sessions or $60 per half-day session if paid by August 28, 2012. Additional $20 if paid after August 28, 2012. RSVP:Contact Irene at irene.hu@gmail.com for registration or call Sifu Tony Wong at (415) 378-8661 for more information. P.O. Box 156, Moffett Field, CA 94035. Cost: $50 before June 4, 2012. Additional $20 at the door. Registration Contact: Xian Na (Galina) xian-na@hotmail.com Instructions: Chen Style Taijiquan Xin Jia "yi lu" (first form) and applications. Master Chen Bing: a 20th Generation of Chen Family Taijiquan and nephew of Chen Xiaowang; three-time National Push-Hand Champion from China; a three-time first place winner in Push-Hand and Taijiquan in Wenxian, China; a two-time International Taiji Competition Gold Medalist; head of Taiji coach at the University of Shanghai for many years before he returned to Chenjiagou. Grandmaster Chen Xiaowang: a 19th Generation of Chen Family Taijiquan; widely acknowledged as the "Standard Bearer" of Chen Family Taijiquan. He is the direct descendant of Chen Wang Ting, the founder of Taijiquan. Grandmaster Chen Xiaowang began his training at the age of eight under the tutelage of his father and then under Chen Zhaopei and Chen Zhaokui. He is one of the best Chen Taijiquan practitioners in the world and particularly famous for his fa jin ability. *Capacity:Limited to 30 participants: Send in your payment ASAP to reserve your space. Master Chen is the student of Chen Zhaokui in Chen Style Taijiquan and Ning Dazhuang in Yang Taiji and Yiquan (I-chuan). Chen Zhengzhong is from Wang Xianzhai's lineage. He is also the Vice-President of the Hong Kong Yiquan Society. This workshop will cover the fundamental theory and exercises of Zhan Zhuang (standing post postures), Shi Li (Testing the strength exercise), and Moca Bu (friction stepping for strength development). Basic Xinyi (5 elements) practice may be covered if time allows. Chen Zhengzhong is a very direct and open martial artist with practical approach just like how Wang Xianzhai's original intent of creating Yiquan system. NO Kong Jin (empty force) will be taught in this workshop. *Time: 2 p.m. to 5 p.m.
*Time: 6 p.m. to 8 p.m.
*Location: 1314 Lincoln Ave, Suit 2B, San Jose, CA 95125(Downtown Willow Glen) Workshop located on the second floor and parking is in the back. *Capacity: Limited to 30 participants. Send in your payment ASAP to reserve your space OR bring CASH to the door. Time: Day 1( 9/4/2010): 2:00 p.m. to 5:00 p.m. Cost: $50 half day; $100 full day or $220 for all three days before 8/31/10. Additional $20 at the door. Location: In the mid peninsula area. RSVP with Kiyoko and she will send you the detail information. Instructions:Review Chen Style Taijiquan Xin Jia "yi lu" (complete first form) on Day 1 (9/4). Xin Jia Erlu (pao Chui) will be taught on Day 2 and Day 3 (9/5 and 9/6). The Xin Jia Taiji system will be taught in this workshop is the direct version from Grandmaster Chen Xiaowang without any derivations. Prerequisite: Working knowledge of Xin Jia Yilu form up to 1st "single whip" posture. For those of you who would like to attend this special Xin Jia Er Lu Workshop, but are not familiar with the Xin Jia form, you can attend Sifu Tony's (Day 1) Xin Jia review class on Saturday, September 4th, and learn up to "single whip". Or join the review class for Xin Jia Yilu (first form) with Sifu Tony on 8/22 Sunday: 10 a.m. to 11 a.m. ($20 for public) at Westlake Community Center, 145 Lake Merced Blvd, Daly City. Registration: Limited to 20 participants. Contact Kiyoko at: yourfriendkiyoko@mac.com for registration or call sifu Tony at at (415) 378-8661 for more information. Time: 9 a.m. to 12:00 p.m. & 2:00 p.m. to 5:00 p.m. Cost: $120 per day or $200 for two days before 5/11/10. Additional $20 after 5/11 or at the door. Location: In the mid peninsula area. RSVP with Sifu Tony and he will send you the detail information. Instructions: Chen Style Taijiquan Xin Jia "yi lu" (first form) and applications. First half of the form on 5/15 and second half of the form on 5/16. Review class with Sifu Tony on 5/9, 10 a.m. to noon ($20 for public) at Westlake Community Center, 145 Lake Merced Blvd, Daly City. Registration is limited to 20 participants. ***Registration required*** Email: sifu Tony at wongwaiyi@hotmail.com or call (415) 378-8661 for more information. 2010, April 25:Lao Jia Yilu second half review at 9 a.m. - 12 p.m.
Farewell dinner at 6 p.m. Restaurant - TBD; Cost:$20; RSVP to Tony for the dinner and the location on the morning of workshop. Grandmaster Chen Qingzhou will be in the US in March and April. More workshops locations and details TBA later. Contact Sifu Tony wongwaiyi@hotmail.com for more details for 3/13 and 3/14 workshops. $220 for both days, $120 for one day. 9am-11:30am in the morning and 2:00pm to 4:30pm in the afternoon. Bring cash to workshop. Grandmaster Chen Qingzhou, nineteenth-generation successor and direct descendant of Chen Family Taijiquan Gong Fu Frame, believes that Traditional Chen Family Taijiquan is a treasure of China and should belong to the world. It is his goal to preserve this old ancient martial art, Lao Jia Chen Taijiquan and pass it down to the next generations "unchanged" as it was passed down to him from his teacher, Grandmaster Chen Zhaopei. **Capacity:Limited to 30 participants: RSVP and registration are required to Nathan Ng at artoftaiji@gmail.com. **Make check payable to: Anthony Wong & send check to American Chen Taiji Society, P.O. Box 156, Moffett Field, CA 94035. ***Special Dinner after workshop (6:00 p.m.) on August 30: Cost is $30 per person. RSVP to Nathan at artoftaiji@gmail.com Nathan will let you know the location of the restaurant in Palo Alto. ***Short Xin Jia review classes ($20 per class) are available on 7/19/09 and 8/16/09 from 10:00-11:30 a.m. at Westlake Community Center, 145 Lake Merced Blvd, Daly City, CA. Master Chen Youze: a 20th Generation of Chen Family Taijiquan; widely acknowledged for his distinctive Fa Jing power; Three-time national confrontational push-hand champion; National coach, and son of Master Chen Qingzhou, will be teaching Chen Style Lao Jia Taiji, Applications, 5 kinds Chen Taiji Push hand drills, pole shaking and basic 8 energies training. Master Tony Wong will perform Chen Taiji Lao Jia First Form and lead the group to practice four primary energy of Taiji at this event. Time: 3:30 - 4:15 p.m. This is one of Stanford BeWell's all campus events. Stanford invites students, faculty, staff and friends to come together to experience an Unwind Event together. Students are welcome to stay for as many sessions as they would like. These exercises will help the students relieve their stress, feel more energized and be more mentally focused. All are welcome to join and participate in this event! *Cost: $220 for both days or $120 for one day. Bring CASH (additional $20 for late payment) to workshop if check not received in mail by 9/26/08 or bring check to McKenzie Park on 9/28/08 between 9:00-10:30 a.m.
** Make check payable to: Anthony Wong & send check to American Chen Taiji Society, P.O. Box 156, Moffett Field, CA 94035. Master Wong Wai Yi (Tony) and Master Tony Mak will be giving a workshop on Chen Family Taijiquan training techniques on Taiji Sphere and Taiji Bang. They are both Chen Taiji Masters from the 20th Generation of Chen Family Taijiquan and International Taiji Gold Medalists. Wuji Qigong and Stand will also be emphasized at the beginning of the workshop to prepare participants for proper body alignment and connection. Other US National Taiji Gold Medalists will demonstrate Chen Taiji empty hand forms, Chen Taiji 5 kinds of push hand patterns and weapons at the workshop. Taiji Masters from different taiji schools are invited and welcome to join the demonstration at 12:00 p.m.
Taiji Sphere: a training tool to train the dan tein connection and rotation; a very useful tool to implement and increase internal strength with applications. It's an important tool to make the dan tein come to live. Taiji Bang: a training tool to train "qin na"(capture and grasp) technique that enables students to learn the principles of "qin na" and to be able to apply the internal strength to hand techniques. ***We have several Taiji Spheres from China, but bring a medicine ball, volleyball, or bowling ball just in case. We have taiji bangs for the participants to use. Cost:$100 suggested (you can always make more donation and it's tax deductible). All proceeds go to Red Cross for the China Earthquake Fund. Martial Art Masters from all over Bay Area will perform a demonstration at Santa Clara Convention Center between 7:30 p.m. to 10:30 p.m.
Tickets ($20 each) may be picked up at Li's Wu Shu Academy, 10268 Bandley Drive, #107, Cupertino. Write check payable to: Tiger Claw Foundation. Call (408) 973-8880 for more details. Chen Taiji Demonstration led by Sifu Vivian (Chen Taiji Gold Medalists) - empty hands forms, Chen taiji spear, and push hands. Cupertino Memorial Park (corner of Stevens Creek Blvd. and Mary Ave) at 12:40 p.m. to 1:00 p.m.
2008, April 10:Master Tony Wong will be starting off the Asian Pacific Islander (API) Heritage Month celebration with a Chen Taiji (Lao Jia) demonstration and a taiji fundamental and applications workshop at Foothill College Student Lounge at 12:00 p.m.
Chen Style Xin Jia First Form and applications - September 1. Push hands drills - September 2. Private session will be offered only to taiji instructors and invited guest - August 31(email Sifu Tony for more information). * Cost: $220 for both days or $120 for one day. Bring CASH (additional $20 for late payment) to workshop if check not received in mail by 8/28/07. * Limited to 30 participants: RSVP and registration are required. Email Sifu Tony at wongwaiyi@hotmail.com to receive a registration brochure. * Make check payable to: Anthony Wong & send check to American Chen Taiji Society, P.O. Box 156, Moffett Field, CA 94035. 2007, May 19 - 20: Chen Style Taijiquan Xin Jia "yi lu" (first route) and Chen taiji qigong (5/19), & push hands and applications (5/20) with Master Chen Xiaoxing. Xin Jia Yilu review class with Sifu Tony will be held on 5/13 at Daly City Westlake Community Center next to the Gym from 10:00 to 11:00 a.m. (see location address below). $15 for this review class. Time: 8:30 to 11:30 a.m. & 2:00 to 5:00 p.m. Cost: $200 per person for both days or $120 for one day. Free Demonstration: 8:00 - 9:00 p.m. on May 17, 2007. Location: Westlake Community Center, 145 Lake Merced Blvd, Room 14, Daly City. Master Chen Xiaoxing: a 19th Generation of Chen Family Taijiquan. He is the direct descendant of Chen Wang Ting, the founder of Taijiquan. He began his training at the age of eight under the tutelage of his father and then under Chen Zhaopei and Chen Zhaokui. He is one of the best Chen Taijiquan practitioners in the world and the Principal and Head Coach at the Chen Taiji School in Chen Village (Chenjiagou). Master Chen Xiaoxing will be teaching the Chen Style Xin Jia Yi Lu form and applications at the workshop. Xin Jia Chen Taiji was created in a more systematic way by the legendary 17th Generation Grandmaster Chen Fake, based on the principle and movements of the Lao Jia in combination with his lifetime martial art experience. The Xin Jia system was brought back to Chen Village by Chen Zhaokui to spread this new system, which has more obvious circles, storing and releasing powering with very graceful movements. Master Chen Xiaoxing's older brother, Chen Xiaowang, widely acknowledged as the "Standard Bearer" of Chen Family Taijiquan will continue the Xin Jia teaching in the September 1 - 2, 2007 workshop. 2007, May 12:Chen Taiji demonstration at Cupertino Memorial at 1:15 p.m. for the Mother's Day Event. 2007, April 27 - 28:Two days workshop from 10:00 a.m. - 5:00 p.m. These workshops will focus on detailed knowledge of the Hun Yuan taiji system with applications created by Grandmaster Feng Zhiqiang that blends traditional Chen-style taiji with Xinyi Quan and internal "gong" exercises. Qigong and push hands exercises will be taught as well. Check: http://www.hunyuan-taiji.org/md_workshop.html or call Michael Dorgan at 408-294-9079 for details. 2007, April 26:Free demonstrations and lectures from 8:00 p.m. - 9:00 p.m. on Hun Yuan Taijiquan System by Master Chen Xiang (Head instructor at the Feng Zhiqiang Martial Arts Academy in Beijing) and Master Feng Xiuqian (Master Feng Zhiqiang's daughter)Location: Westlake Community Center, 145 Lake Merced Blvd, Room 14, Daly City, CA. Instructions: Chen Style Taijiquan Xin Jia "yi lu" (first form), Chen Taiji push-hand patterns with an emphasis on the eight energies, and applications review. Master Chen Bing: a 20th Generation of Chen Family Taijiquan and nephew of Chen Xiaowang and Chen Xiaoxing; three-time National Push-Hand Champion from China; a three-time first place winner in Push-Hand and Taijiquan in Wenxian, China; a two-time International Taiji Competition Gold Medalist; head of Taiji coach at the University of Shanghai for many years before he returned to Chenjiagou. Email: Amara Goodman at amarapetals@hotmail.com to receive a registration brochure or download from the Chen Family Taiji Chatroom. Thursday - 3/29/07 from 8-9 p.m. at Westlake Community Center, 145 Lake Merced Blvd, Room 14, Daly City, CA. Wednesday - 3/28/07 from 7:30 - 8:30 p.m. at Little House (Auditorium) 800 Middle Avenue, Menlo Park, CA. *Donation ($10) to the American Chen Taiji Society (ACTS) will be greatly appreciated. All proceeds will go directly to the Chen Taiji School in China for scholarships to disadvantage taiji students. Chen Taiji Demonstration lead by Sifu Vivian and Chris - empty hand forms, Chen taiji spear, and Saber. Time: 3:45 to 4:00 p.m.
Chen Taiji Demonstration - empty hands forms, Chen taiji spear, and push hands. Cupertino Memorial Park (corner of Stevens Creek Blvd. and Mary Ave)at 12:30 to 1:00 p.m.
* Cost: $240 for both days or $130 for one day. Bring CASH to workshop after you RSVP if you haven't put payment in the mail already. * Limited to 30 participants - registration required. Email Amara Goodman at amarapetals@hotmail.com to recieve a registration brochure. Make check payable to: Amara Goodman and send to American Chen Taiji Society, P.O. Box 156, Moffett Field, CA 94035.
and on 8/20/06 at 10:00-11:00 a.m. at Westlake Community Center, 145 Lake Merced Blvd, Daly City. 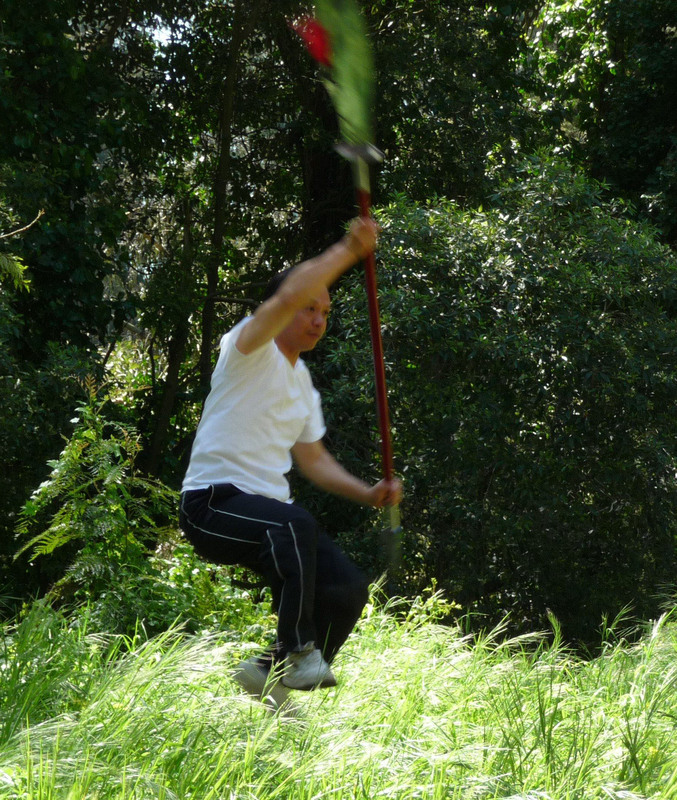 Daly City Taiji (Tai Chi) class will perform Traditional Chen Taiji empty hand forms, weapons, and push hands at noon. Taiji information booth to provide Taiji class information and answer related questions will open from 10 a.m. - 4 p.m.
Time: 8:30 a.m. to 11:30 a.m. & 2:00 to 5:00 p.m.
Dinner: May 28 at 5:00 p.m. in San Francisco. Cost is $20 per person. Master Chen Xiaoxing: a 19th Generation of Chen Family Taijiquan. He is the direct descendant of Chen Wang Ting, the founder of Taijiquan. He began his training at the age of eight under the tutelage of his father and then under Chen Zhaopei and Chen Zhaokui. He is one of the best Chen Taijiquan practitioners in the world and the Principal and Head Coach at the Chen Taiji School in Chen Village (Chenjiagou). Master Chen Xiaoxing will be teaching the Chen Style Xin Jia Yi Lu form and applications at the workshop. Xin Jia Chen Taiji was created in a more systematic way by the legendary 17th Generation Grandmaster Chen Fake, based on the principle and movements of the Lao Jia in combination with his lifetime martial art experience. The Xin Jia system was brought back to Chen Village by Chen Zhaokui to spread this new system, which has more obvious circles, storing and releasing powering with very graceful movements. Master Chen Xiaoxing's older brother, Chen Xiaowang, widely acknowledged as the "Standard Bearer" of Chen Family Taijiquan will continue the Xin Jia teaching in the August 27-28, 2006 workshop. Time: 8:30 a.m. to 12:00 p.m. & 1:30 to 5:00 p.m.
Time: 7:00 p.m. to 9:30 p.m. Cost: $70 per person for the first 20 participants; $110 for 21st-25th participant. Workshop is limited to 25 participants. Instruction: first half hour - qigong; second hour - push hands; last hour - pole shaking. Note: NOT for beginner students. Master Chen Zheng-Lei: A 19th Generation of Chen Family Taijiquan. He is known as one of the "Taiji Jingangs" in Chenjiagou. He is a two-time Taijiquan Grand Champion at the National Taijiquan Competitions, and has won over 10 gold medals at the Henan Martial Arts Competition. Cupertino Memorial Park (corner of Stevens Creek Blvd. and Mary Ave) at 12:50 p.m.
City of San Jose's Guadalupe River Park and Gardens Grand Opening Celebration from 11:00 a.m. to 1:00 p.m.
Topic: Chen Taiji 19 Forms & Applications - The Chen 19 form is a combination of postures from the three major styles of Chenjiagou Taijiquan: Lao Jia (Yi Lu), Xin Jia, and Xiao Jia. Cost: $200 for both days or $120 for one day if paid before 8/15/2005. $220 for both days or $140 for one day if paid after 8/15/2005. Limited to 35 participants - RSVP required. Click here for registration form. Make check payable to: Amara Goodman and send to: American Chen Taiji Society, P.O. Box 156, Moffett Field, CA 94035. Dinner: After the workshop, dinner will be held at 6:00 p.m. on Sunday, September 4, at Canton Seafood Restaurant (three blocks from the workshop). $20 per person. Short workshops or private lessons are available from 8/30 - 9/2/2005 on a first come first serve basis through appointment. Fee: $150 per hour for one person; or $200 total if two people want to do an hour together. Master Chen Xiaowang: a 19th Generation of Chen Family Taijiquan; widely acknowledged as the "Standard Bearer" of Chen Family Taijiquan. He is the direct descendant of Chen Wang Ting, the founder of Taijiquan. He began his training at the age of eight under the tutelage of his father and then under Chen Zhaopei and Chen Zhaokui. He is one of the best Chen Taijiquan practitioners in the world and particularly famous for his fa jin ability. - Taiji Basic Footwork Drills; Wuji Qigong standing and correlation with push-hand and application drills; Chen Family Taiji Sphere. - Yi Quan basic stances and internal alignment; Yi Quan basic maneuvering and footwork; Yi Quan testing strength drills. Master Wong Waiyi (Tony): a 20th Generation of Chen Family Taijiquan; disciple of Master Chen Qingzhou; one of the very few Taiji Masters outside of China granted the "Ming Shi" (Renowned Master) title by the International Taijiquan Conference of Wenxian, China; International Taiji Competition First Grade Award & Gold Medalist. Master Lu Zhiyou: Senior disciple of Grandmaster Qingzhou; President and head coach at City of Luohe Municipal Chen Style Taijiquan Association; Push hands champion in Henan Province. Cost: $25 per person for the first 20 Tony's students or his students' students who register for this workshop. Instruction: Pole shaking techniques to increase fa jin and solo Taiji movements. Please bring your own pole. Hosted by Traditional Chen Taiji Club at San Jose State University, Central Plaza at 11:45 a.m. to 12:30 p.m.signup today! Master Chen Bing will be conducting a 3-hour push hands seminar in the Bay Area on 10/7/2004 evening. NO BEGINNER! Contact Sifu Tony directly if you are interested. There are only a few spaces left. Chen Family Taiji System by Peter, John, Steve, Chris, Vivian, and Singkin. Everyone is welcome to come support this event. 11:00 a.m. in SF Chinatown on Washington Street near Wentworth Alley. Chen Family Taiji System by John, Anita, Vivian, Chris, Peter, and Singkin. 2:00 p.m. - Chen Style 24 Cannon Fist by Sifu Tony. Grandmaster Chen Qingzhou will be in the Bay Area in March 2004. If you are interested in attending any of the following events, please contact Tony Wong. 2003, August 23: Daly City Lincoln Center Grand Opening Event: Chen taijiquan demonstration is at 12:00 - 12:15 p.m.
2003, July 30: Chen Taiji Demonstration at SF YMCA's 150th Anniversary Celebration sponsored by Stonestown YMCA: City Hall, San Francisco; 12:00 - 2:00 p.m.; Loren Chin's demonstration is at 12:30 p.m.
2003, May 17: Chen Taiji Demonstration: Serramonte Shopping Center, Daly City; 12:30 p.m.; Other demonstrations before and after the Chen Taiji demonstration, beginning about 11:30 a.m.